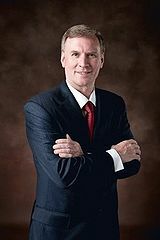 Charles Obadiah "Chuck" Baldwin (born May 3, 1952) is a founder-pastor of Crossroad Baptist Church in Pensacola, Florida, and was the presidential nominee of the Constitution Party for the 2008 U.S. Presidential election. He was also the Constitution Party nominee for U.S. vice president in 2004. He hosts a daily one-hour radio program, "Chuck Baldwin Live", and writes a daily editorial column carried on its website, on VDare, and in several newspapers. As a Republican Party member, Baldwin was state chair of the Florida Moral Majority in the 1980s. However, during the 2000 campaign of Republican George W. Bush for U.S. President, Baldwin vacated the party and began a long period of criticism of Bush. Baldwin endorsed U.S. Representative Ron Paul for the 2008 Republican nomination for president, and Paul in turn endorsed Baldwin for the presidency in the 2008 general election. The two have similar platforms which involve adhering to and maintaining the United States Constitution against supposed violations. Out of the users that have visited this site 458 out of 65123 say they would write in Chuck Baldwin if they knew the write in would help get him elected for president. (Not every candidate is registered/eligible for write in votes in every state).